I’ve always noticed that Jiminy hold. A great drawing but so incongruous for a Disney feature that I thought it might be a shooting mistake. 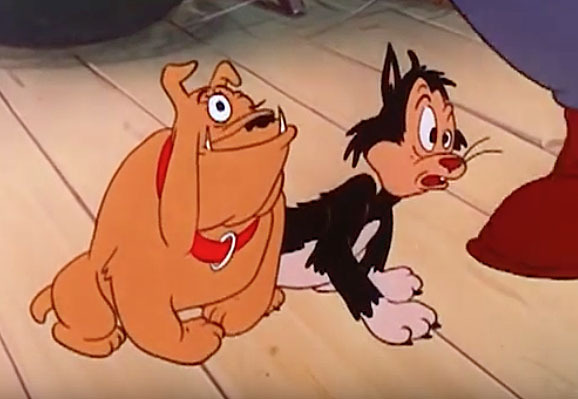 Why it couldn’t have been a moving hold as he stretches (Almost like what Chuck Jones used all the time for the Coyote falling) puzzled me. There is a thing I have done where something is dragging on twos before it snaps and I put the drawing before the snap on three and the snap on one. Very subtle and makes the snap snappier, but this sequence looks un-inbetweened. Maybe Walt Disney was tired, didn’t catch it, said it was great, and Ward Kimball happily did as he was told ?? .